to check if it is imported correctly or not, please follow the guide here in this page. 1. Open "option" menu from tool menu or menu icon. 2. 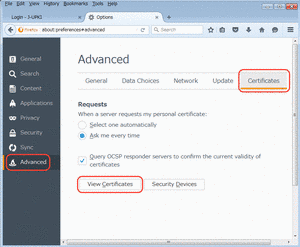 Click "Advanced" -> "Certificates" -> "View certificates"
3. 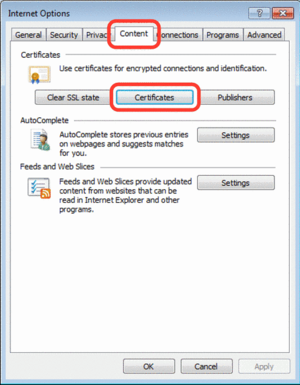 Click "Your certificate" tab and confirm that your digital certificate is shown in the window. 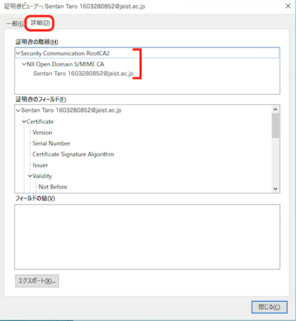 "国立情報学研究所 オープンドメイン S/MIME用 SHA-2認証局(NII Open Domain S/MIME CA) CA証明書(nii-odcasmime.cer)"
1. 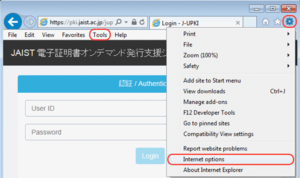 Open "Internet Option" from tool menu or tool icon. 2. 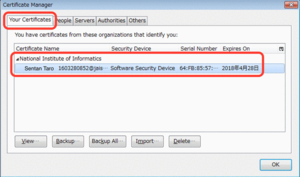 Open contents tab and click "certificate" button. 3. 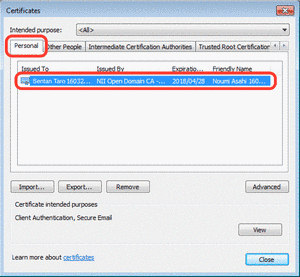 Open "Personal" tab and confirm that your digital certificate is shown in the window.